Weekly Pillbox Pill Dispenser for Pills and Vitamins. New from e-pill Medication Reminders (www.epill.com). Never forget to take your medications again! Start using a Medication Reminder APP on your Apple Watch (or e-pill Cadex Watch) + an Accutab Pill Dispenser from e-pill Medication Reminders. Feel better. FREE Standard Shipping. NO Monthly FEES. Free Gift with every order. 30-DAY Money Back Guarantee. One Year Warranty. Easy-to-Fill and Easy-to Use e-pill Accutab pill Dispenser today to make your smart watch medication reminder function work better. Example: Apple Watch will launch with a free medication reminder app from WebMD. WebMD's Apple Watch APP will enable consumers to view daily medication schedules and instructions, as well as pill images with dosage and timing information, plus receive reminders when it's time to take a given medication – right on their Apple Watch. Never forget to take your medications again. Avoid medication errors. Feel better. Order your e-pill Accutab pill dispenser today.Free SHIPPING (standard shipping) and Free GIFT with every order. NO Monthly FEES. Popular e-pill Accutab manual pill dispenser / pill organizer / semi-automatic pill box installs under or inside your kitchen cabinet or medicine cabinet (medicine chest). This e-pill Accutab automatic pill dispenser takes the work out of organizing and identifying medications. Easy to Use even for Patients with Severe Arthritis: The concept for the e-pill Accutab dispenser was developed by an arthritis patient. Accutab has an added bonus for patients with arthritis whose condition makes it painful to open medicine bottles / medicine vials multiple times per day. The Accutab does not require AC power or batteries. Mounting bracket included. 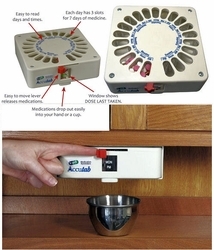 Weekly e-pill Accutab pill dispenser simplifies taking multiple medications. Installs under or inside kitchen cabinet or medicine cabinet. Medications drop down into patient's hand. Easy to dispense even for old hands. Simply slide lever to auto rotate dispensing tray. Unique LAST TAKEN Indicator. Shows patient or caregiver when medicines were last taken. 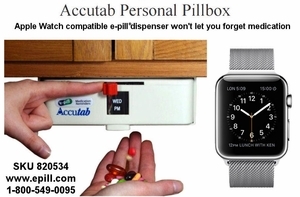 Combine Accutab Pill Dispenser with an Apple Watch (smart watch) or e-pill Alarm Watch, Pill Timer or LOUD Alarm Clock. Once-A-Week loading (fill every 7 days). Organize / Medical ID / Schedule: The weekly pillbox is loaded once a week by caregiver or patient. When it is time to take medications, just move the lever on the front of Accutab pill dispenser from left to right to dispense the pills. This weekly pill dispenser is often used with an e-pill medication reminder timer. Large medication capacity; each compartment can hold up to 25 aspirin sized pills and multiple medications. Avoids daily use of hard to open medication vials. Great for Vitamins and Supplements. Popular gift for anyone needing a little help with their medicines. This device is MUCH BETTER than pill boxes or trays. The patient does not have to open any little lids. The slots are large. The lever is easy to push. It is fun for the patient to hold a little cup under the device and push the lever. The caregiver/family member can easily see if the patient has taken the dose out of the device on time. IT IS GREAT!!!A. R.
Accutab PIll Dispenser is NOT child proof. Capacity: 25 aspirin sized tablets in each compartment. 21 total compartments (7 days x 3 doses per day). Clearly labeled 'Day of the Week' and 'AM', 'Noon' and 'PM'. LAST TAKEN Indicator display. Size: 6 3/4 inch x 6/3/4 inch x 2 inch. Mounting bracket 8 inch x 6 1/2 inch (needs 8 inch total depth for mounting) x 3 1/4 inch. Mounting bracket and screws are included. Refill once-a-week. Great for Vitamins and Herbal Supplements.